Top of the list for most winter visitors are the snow sports on offer and particularly skiing and snowboarding. 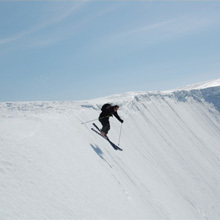 The snow sports typically take place between December and April, depending on snowfall; winter operating hours are usually between 9am and 4pm depending on daylight. There are more the 30km of ski runs as well as a fully maintained snowboard park; with cross country skiing also popular and Disability Snowsports UK offering snow sports tuition for the disabled.